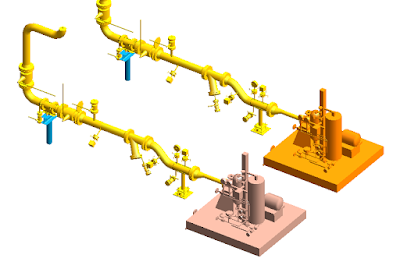 PDMS Macro set Linelist is tool to enter attribute data link to the list PIPE object in PDMS program for display on Isometric drawings made with PML progamming. Indeed, most attributes of the data line list entered by way of bulk load from an Excel file into PDMS program. 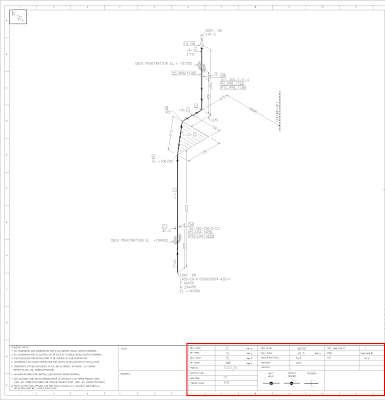 But even so often there are circumstances where the need to enter the attributes manually, when the stage of Piping Isometric drawing revisions. And now I use during the revision stage Piping Isometric drawings. 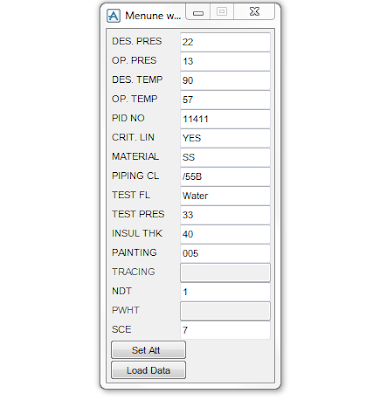 Menu CE : load attribute data CE pipe to form. Menu Load From : to copy data from a pipe with the same attributes, so that the attributes that are in PIPE selected will be copied into form / menu set Linelist. Menu Set Att : used to enter the data from the form menu in PIPE. 1. Open file IsoDesignAtt.pdmsid with notepad. 2. Change variable !folderlocation with path name where you put this macro file and save. 3. Open file setinganBro.txt with notepad, change all value with order NAMEonForm|AttributeNAME|DataType. 4. Drag and drop the PDMS Macro set Linelist (IsoDesignAtt.pdmsid) to PDMS commandline, will show the menu. 5. Select Current Element on PIPE. 6. Fill manually linelist data to the menu or click Load From button to copy data from other PIPE by selecting that PIPE. 7. Click Set Att button to insert value of linelist data to PIPE attribute on PDMS. Below is the sample of isometric drawing which display the attribute from PIPE PDMS object.